We are so excited to reveal this project!! 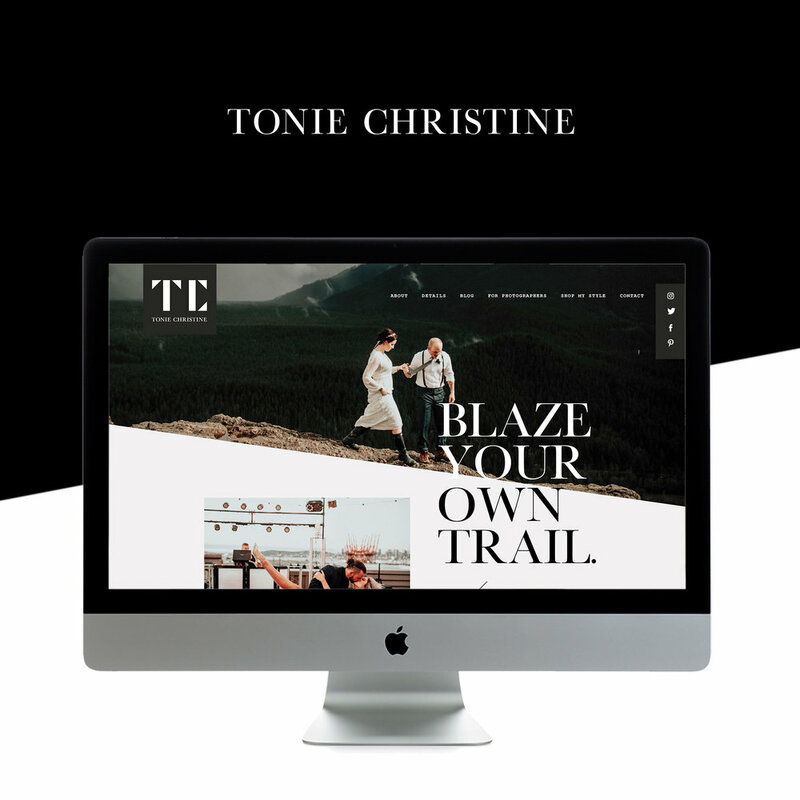 Tonie Christine’s original photography site was built by GoLive almost 7 years ago, but she was ready to rebrand, upgrade, and get a new look to match how her business has grown. We’ve loved watching her business grow alongside our own, and getting to partner with her on this redesign was so special for our team! Tonie still loved the vibe of her original site design — even after 7 years!! — but felt it needed a facelift. She loves the modern, exciting, bold and clean aesthetic, so our team work to accomplish that with her new Custom Website built on Showit. Tonie is so passionate about what she does, it was amazing to see walk through our process and streamline her website content! I think we ended up with a killer website ready to blaze it’s trail on the web!! Check out our Q-and-A with Tonie below about her photography business, how she knew she wanted to work for herself, and her big tips for getting organized. GOLIVE: WHERE DID YOUR PASSION FOR THE INDUSTRY OR CRAFT START? Tonie: In Business!!! Really my passion and heart are in business and entrepreneurship in general, so my love for all things marketing and watching a business grow really started in high school when I got my business license for my photography business. GOLIVE: DID YOUR EDUCATION HELP PREPARE YOU FOR THE INDUSTRY OR FOR STARTING YOUR OWN BUSINESS? OR ARE YOU SELF-TAUGHT? Tonie: I am definitely self-taught and darn proud! Of course I have taken workshops, done mentorships and went to college for Business Administration, but I started my business long before any of those took place. I believe it’s SO important to every single year invest in some sort of education (either a mentor, a consult with someone in your industry you admire or a continuing education workshop that you have fully researched!) in order to really stay motivated and on top of your game as our industries are every changing! GOLIVE: WHAT’S THE HARDEST LESSON YOU’VE LEARNED IN YOUR BUSINESS? Tonie: That there is no such thing as "work-life" balance or that "if you love what you do, you will never work a day in your life" isn't actually true. For real...working for yourself and building your own business is obviously so rewarding, but many people don't want to actually do the nitty gritty (hard hustling) stuff and that's where a long standing business differentiates itself from one that passes in the wind. GOLIVE: WHAT DO YOU WISH SOMEONE WOULD HAVE TOLD YOU WHEN YOU STARTED OUT? Tonie: GET ORGANIZED before you start charging people. Since I started my business at 17, many people didn't take me seriously. So, I wish someone would have sat me down grabbed my shoulders and given me a good shake, or at least told me to WAKE UP! Get your business license, have a FULL plan in place for documenting ALL your client interactions and payment, have a lawyer reviewed contract and put your best foot forward. All of these things seem daunting, but when done AHEAD of time will serve you so much better than if you find yourself in a sticky situation without one of them. GOLIVE: WHAT WAS THE MOMENT YOU AHD WHEN YOU SAID, “I SHOULD DO THIS,” AND START WORKING FOR YOURSELF? Tonie: I knew I wanted to work for myself after I had went into a field that I THOUGHT was my "dream job" in marketing and quickly realized the day in and day out was awful. I began planning and strategizing a 6-month "building phase" business plan to set myself up for success and giving myself a launch date to go full time with my business. Only 3 months after leaving my full time job, I had DOUBLED my salary from that job and 90 days after that I had tripled it. It's not always about how much money you bring in, but it does feel good to blow your OWN socks off what you thought you were capable of! GOLIVE: WHAT THINGS HAVE YOU GAINED / DO YOU HOPE TO GAIN IN YOUR LIFE FROM FOLLOWING THIS DREAM? Tonie: Being able to do a 7 week trip to Maui with my husband and two young kids has been a pretty amazing dream that became a reality. Since my husband gets great paternity leave, I am able to pick up my business, work virtually AND still make incredible art with clients in a new area while on vacation and still making money and memories. GOLIVE: ANYTHING ELSE WE SHOULD KNOW OR WANT TO GET OFF YOUR CHEST? Tonie: Ya'll quit spending HOURS dinking around trying to make a semi-decent website...instead, hustle hard and bring in some new clients and then SAVE that money up to hire a team of people to make your online presence awe-inspiring and one that stands out from the rest! WANT A DARK & MOODY SITE DESIGN?